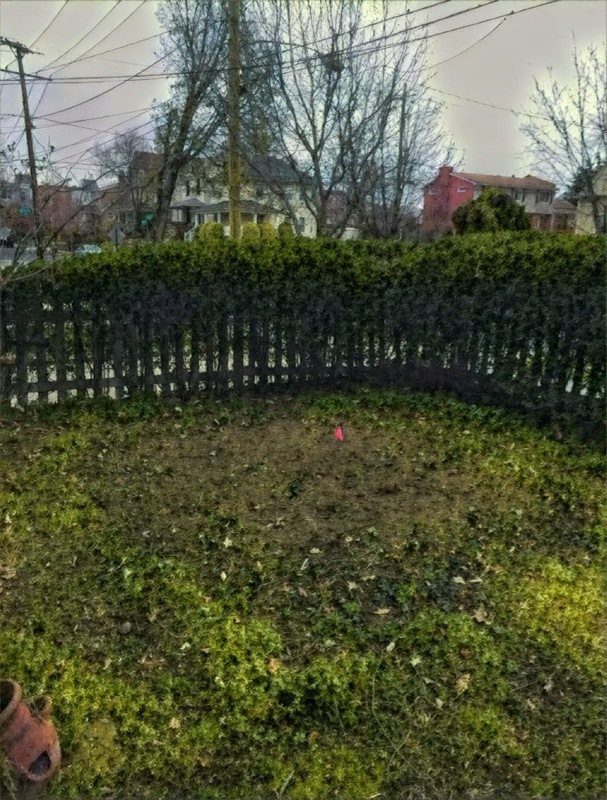 Our front yard started with a big honking For Sale sign (which I had The Spouse rip out of the ground as soon as we closed on the house because I didn’t want to give that idiot realtor even one second of advertisement) and a little bit of landscaping. There were two or three hostas, a few mounds of Sweet William and a small boxwood. The shrubbery was about two feet square and maybe eighteen inches tall. 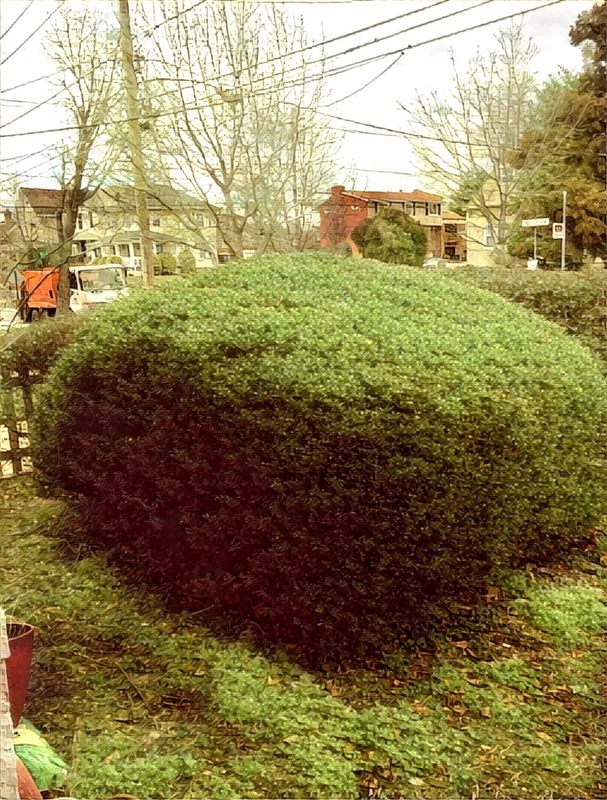 Over the years the boxwood grew. The Spouse had a dull set of clippers he’d use to keep it in shape, but the plant was sneaky. It would always grow a little more than he trimmed. Slowly, it crowded out the hostas. It grew tall and wide, deep green and bushy. Grew being the key word. I’m not sure when I started calling it The Blob. Maybe it was when I noticed that the hostas had been swallowed up. The porch might have been next. But The Spouse was confident that he could control the creature. I was less certain. I didn’t like it. No, I did not like it one bit. The Blob soon engulfed the entire front yard. There was a very narrow path, less than a little trail’s worth, around it. The Blob grew taller than me. Eventually it became impossible to reach to trim the middle of the monster. It overtook the view from the picture window in the toy room. Porch sitters were hidden from sidewalk strollers. Feral cats, raccoons, oppossums and flesh eating spiders (I’m less sure about this last one) lurked in and around it. My dislike for this thing, this Blob, grew along with it. Last winter–when we had a real winter with cold weather and snow–the Beast went mad when we stepped off of the porch. There was a few inches of snow on the ground. He furiously sniffed near the Blob and suddenly bolted. There was something loitering behind that stupid Blob. I was on the ground and he dragged me to the back of the Blob. I was screaming “STOP,” punctuated by short, guttural words that rhymed with truck. The Blob didn’t eat me, but it could have. I was about ready to sacrifice the Beast to the monster. Instead the Beast, surprised to see me on the ground and in the snow, thought it was a game. I did not find it entertaining. No, not one bit. Once, in the Spring, I saw a trio of little sparrows that were being chased by the neighborhood hawk fly into the sanctuary of its boughs. And then there were the nests and little eggs that sheltered in the arms of its nursery. Still, it had to go. Since it was beautiful and healthy, someone said that it was valuable. I tried to give it away. There were a few window shoppers. They looked underneath its branches and were shocked to see that it grew from a one root, a single specimen. Unfortunately, nobody could figure out how to get it out. Well, one guy said he’d need a crane. No takers. So today, Julio and his crew came by. In less than thirty minutes, it was gone. Twenty-five years of growth disappeared in less time than a lunch break. Bye Blob. It was you or the yard. I really won’t miss you, but I am still sad to see you go. Funny how you can have both of those feelings at once. The spot is readied for a birch tree, with that beautiful smooth gray-white bark. The tree will contribute to the replenishment of the city’s tree canopy. It’s native and helps with the water table. It’ll shade the front of the house, host some nests and allow space for ground greenery. I’m thinking hostas. Maybe some Sweet William. Nothing invasive though. We know where that leads.